Use your creativity to turn this vegetable cheese combo into a lip-smacking holiday table. 1. Preheat oven to 350°F and soak cauliflower in a bowl of water. 2. Boil water with 4 teaspoons of salt in a large pot. 3. Once the water is boiled, place the cauliflower upside down (floret side down) in pot. Cook for about 8 minutes or until cauliflower softens slightly, then remove from pot,drain and let cool. 4. Cut the cheeses into small pieces. Stuff the cheeses between the florets of the cauliflower on all sides until the cauliflower is filled with cheese. Make sure to be gentle while stuffing so that the florets don’t break or crumble. 5. When stuffed with cheese, lay the cauliflower on a pan lined with baking paper. 6. Mix the egg with the mayonnaise, black pepper and salt. 7. Use a brush to coat the cauliflower with egg mixture on all sides. Make sure to coat the bottom of the cauliflower as well. 8. 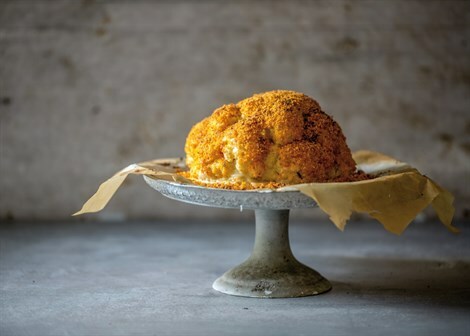 Sprinkle breadcrumbs on the cauliflower until fully coated. The Shavuot festival has always been associated with creating fabulous dairy culinary delights for friends and family. Using Tnuva's fresh dairy recipes, which were created by a renowned Israeli chef, you'll be able to prepare a myriad of amazing, palate-pleasing dishes throughout the holiday and the forthcoming summer season. All Tnuva products mentioned feature the OU and Vaad Mehadrin kashrus symbols and are available at kosher grocery stores and supermarkets across North America.